The last time I saw something like this was at the nyc puerto rican day parade in central park back in 2000. 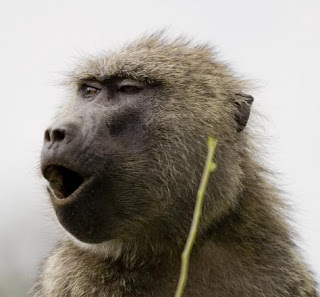 Baboons usually leave their sleeping places around 7 or 8 a.m. After coming down from the cliffs or trees, adults sit in small groups grooming each other while the juveniles play. They then form a cohesive unit that moves off in a column of two or three, walking until they begin feeding. Fanning out, they feed as they move along, often traveling five or six miles a day. They forage for about three hours in the morning, rest during the heat of the day and then forage again in the afternoon before returning to their sleeping places by about 6 p.m. Before retiring, they spend more time in mutual grooming, a key way of forming bonds among individuals as well as keeping the baboons clean and free of external parasites.